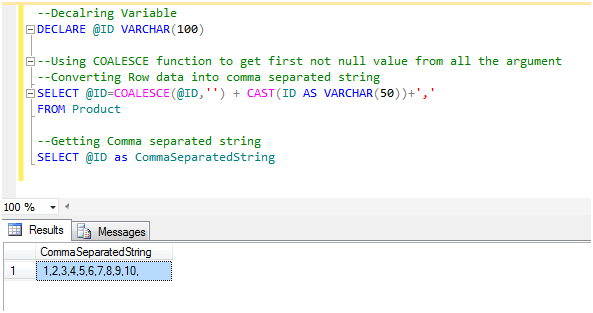 This article describes how to convert the row data into single comma separated string. While developing software application, many times scenarios come to convert the tabular data to comma separated string. Here we are using COALESCE function to achieve the task. 1. COALESCE is a function that returns the first nonnull expression among its arguments. 3. If all arguments are NULL, COALESCE returns NULL. 4. COALESCE determines the type of the output based on data type precedence. 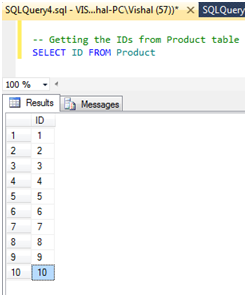 By using the above steps, we can convert the tabular row data into comma separated string.